Ancient ideas about healing may be very powerful. The "new" science of psycho-neuro-immunology is confirming what ancient peoples have always known- that the body and mind are unified. Disruption in this essential harmony may lead to "dis-ease." The body and mind are mutually reflective and interactive. The language of the body may be pain and physical disorder. Imagery is a powerful and ancient language of the mind. Long before we had words, we had images. Indeed a picture may be worth infinite words. Images need not be visual. Any sense (kinesthetic (feeling in the body), sound, etc.) can be expressed in images. Some people believe that they aren't good at "imagery." This is most often NOT true. Do you day-dream? Do you worry? Worry is a negative form of imagery, but imagery none-the-less! Our imagination is a natural gift of the human experience. Cultivating it and our other intuitive senses can be a great source of personal and spiritual knowledge. 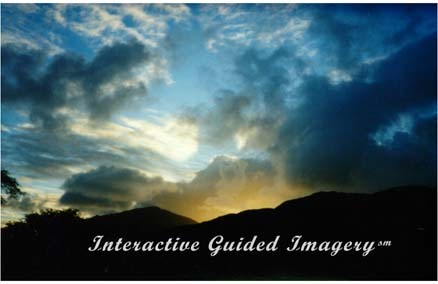 In the process of the interactive guided imagerysm , a person, in a relaxed state, connects to his or her own inner world, one of incredible depth and meaning. On the journeys into this place, special places and helpers are found. Wisdom from advisors, healers, and higher spiritual energies can be explored. Initially, a person is guided through progressive relaxation to a comfortable and peaceful state. In the early explorations, we learn to navigate in this new territory by finding a special inner place, one of good feelings and "specialness," a place where compassion, love and wisdom is available. From this place we can then invite an image of a wise and loving figure that knows you well. This "inner advisor/healer/higher self" often accompanies us as we explore and interact with other images. We get to know images, and harvest information from them. For example, we can invite an image for our pain, our conflict, or our illness. We can give it a voice, ask it what it wants to tell us, ask it how we can work together, what it wants. Another process can be that of working with the image of our "future healed self," how to get there, what are the steps on the path, etc. Or, we can strengthen personal qualities to help us in our daily living. The possibilities are only limited by imagination, and the insight, wisdom, and healing that can come from this process is truly remarkable. There are many questions that you may have about Interactive Guided Imagerysm . Do know that I would be delighted to explore them with you.